Delivering 5.5 horsepower at 4,000 rpm, the auger-assisted drive model Honda HS621A snowblower is equipped with a 4-stroke Honda GX160K1 engine. Also equipped with a recoil starter, the HS621A model has a 1.4 hour continuous operating time. With a 32.8 foot maximum snow throwing distance and a clearing width of 21", it has a dry weight of 95.9 pounds and frame dimensions of 48.4 inches in length, 22.4 inches in width, and 38.6 inches in height. Despite the durability of your HS621A snowblower, you will eventually be forced to replace a part. Even if you perform the required maintenance regularly, normal wear and tear will make this inevitable. Performing the part replacement with the compatible part and doing so correctly is absolutely essential for proper performance. Understanding the difference between original equipment manufacturer (OEM) and aftermarket parts is necessary in order for you to make a logical decision when ordering parts. OEM parts might be a little more costly; however, they are also higher quality parts designed for the exact specifications of your piece of equipment. Because they are designed in such a way, there is only one OEM part for every maintenance need. OEM parts also generally include a warranty. Aftermarket parts, in some cases may cost less, but they are also made by lower standards and different tolerances. Aftermarket or generic parts will generally not be covered on a warranty. We recommend Honda OEM parts for all of our Honda Power Equipment. When you order a part, you will need two pieces of model information: the model number and the series number. This information identifies your particular piece of equipment’s specifications, design, and features in order to find a compatible part to ensure your equipment functions properly. Model and series information is usually located directly on the backside of the frame or lower handle. The HS621A model snowblower contains a GX160K1-TY8 engine. The model number identifies the features and specifications of the equipment. 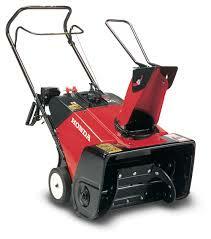 For example, the “HS” abbreviates “Honda Snowblower”. Rounded to the nearest whole number, the 6 indicates the horsepower. The 21 indicates the clearing width, meaning this particular model has a clearing width of 21”. Production for the American market is indicated by the “A”. The HS621A model has three different versions: A, B, and C. Version A is indicated by serial numbers ranging from SZAN-1000001 to 1038238. Version B is indicated by serial numbers ranging from SZAN-138239 to 1099999. Version C is indicated by serial numbers ranging from SZAN-1100001 and up. 3. Enter information about your specific piece of equipment into the “Find Parts by Model” feature. Any of these easy to use methods are guaranteed to find the part you need that is compatible with your snowblower. Honda Lawn Parts provides OEM parts for various assemblies on your piece of equipment, including the drive pulley, muffler, and camshaft. Various equipment accessories are also available. Before you know it, your Honda HS621A snowblower replacement part will be shipped to you. Let Honda Lawn Parts make ordering OEM replacement parts efficient and easy.